Splitting from the rabidly popular Taking Back Sunday may seem like a bad move, but Shaun Cooper and John Nolan knew that it was their only option. Armed with only a concept, the two recruited Nolan's sister Michelle and drummer Will Noon and whipped up Straylight Run, a lush keyboard/ piano based endeavor. While the familiar song structures of Nolan/ Cooper's past band seep through here from time to time, the overall result is an atmospheric collection of 11-tracks that sound like the cross-pollination of Ben Folds Five, Dashboard Confessional and Mazzy Star, with a touch of electronica found on "Tool Sheds and Hot Tubs". 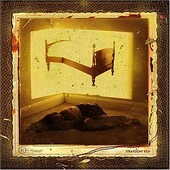 The mid tempo balladry heard on "Existentialism on Prom Night" and "Mistakes We Knew We Were Making" are usually reserved for older, more mature artists, but it looks like no one told Straylight Run, who've created an album laden with heartaching melancholy, pensive melodies, and well-textured musical hues that truly encapsulate the term emo. If you enjoyed the lighter side of TBS, you'll clamor for Straylight Run.